HarbaMaster is a cloud-based marina management software digitalising and simplifying marina management processes. The HarbaMaster marina management software is created in collaboration with marina owners and managers to ensure it is easy to use and adaptable to individual marina needs. It is based on a modular system so you can choose and pay for the modules and functions that you actually need. The HarbaMaster system integrates and works along with the free mobile app for boaters – HarbaApp. We believe it is important to take into consideration both parties creating synergy for the entire boating community. This dual approach has allowed us to design a special environment where information is exchanged between marinas and boaters, building a better understanding and a stronger bond with one another. Get a better overview of who is docking at your marina and when, track who paid and who didn’t – all the data at one place. Send automatic invoices or reminders to multiple boaters and get marina payments directly to your bank account. Choose the module that best fits your marina needs, select preferred functions or request for customised solutions. Send them personalised messages about personal data updates, weather conditions, events or anything you want. Be compliant with money laundering, KYC and data protection regulations with a cash free and data transparent infrastructure. The Guest Module gives you a real-time overview of your marina availability. It lets you attract more boaters and increase income. The module is intergrated with our free mobile app – HarbaApp – that boaters love to use for berth reservations and mobile payments in marinas across Europe. In addition, the app assists in optimising the use of your available berth spots as permanent berth owners can report their occasional trips enabling you to rent vacant spots for other boaters. The module can also play a vital role in handling cash payments and collecting relevant information on your guests such as boat data, contracts and others. The Guest Module gives you a real-time overview of your marina availability. It lets you attract more boaters and increase income. 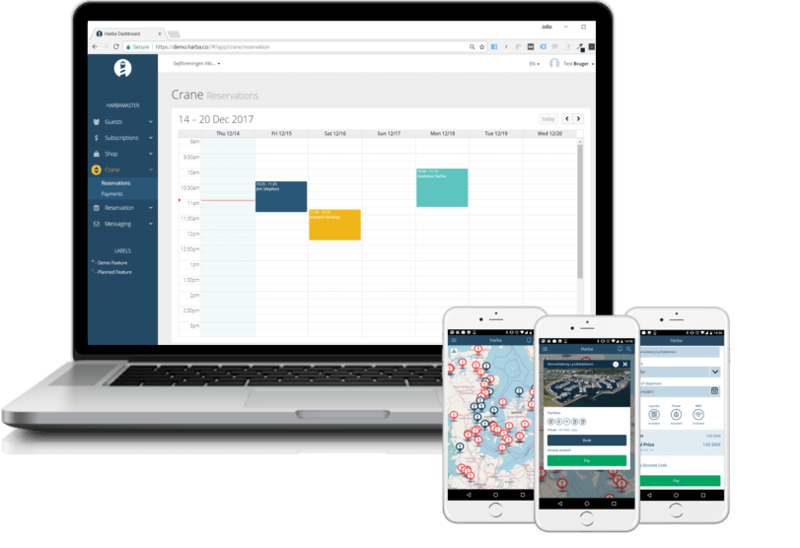 The module is integrated with our free mobile app – HarbaApp – that boaters love to use for berth reservations and mobile payments in marinas across Europe. In addition, the app assists in optimising the use of your available berth spots as permanent berth owners can report their occasional trips enabling you to rent vacant spots for other boaters. 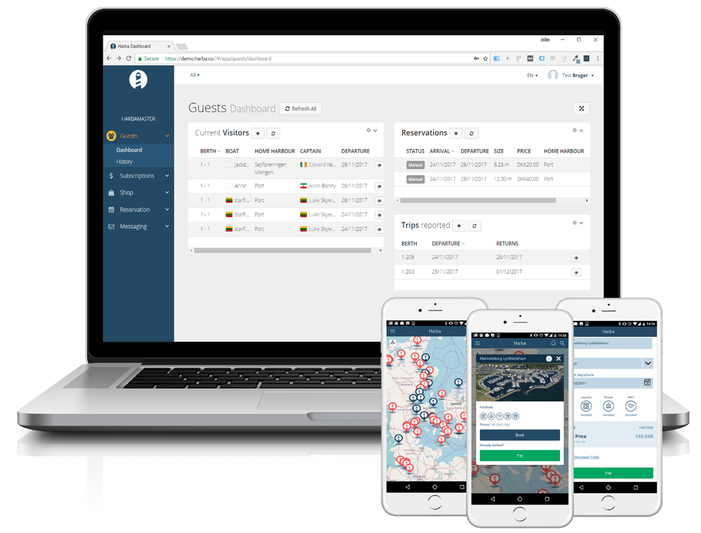 The module can also play a vital role in handling cash payments and collecting relevant information on your guests such as boat data, contracts and others. The Subscription Module is focused on handling all the “permanent” berth holders and boaters who consider your marina to be their home port. 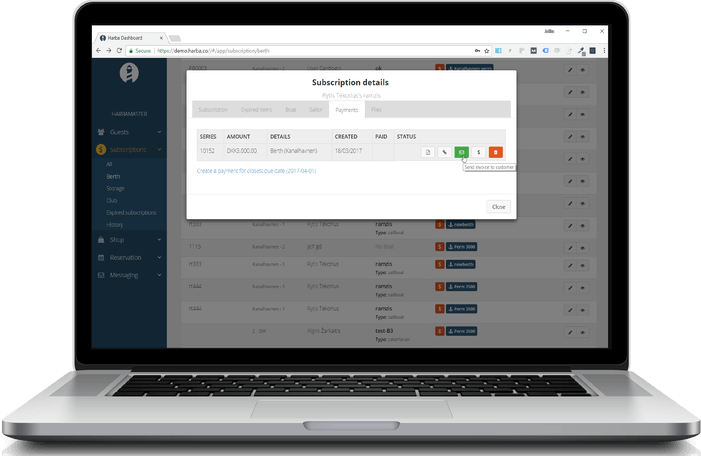 This is your CRM database with information on boats, their owners, contact details, contracts, insurance papers and their current or past subscriptions in your marina. 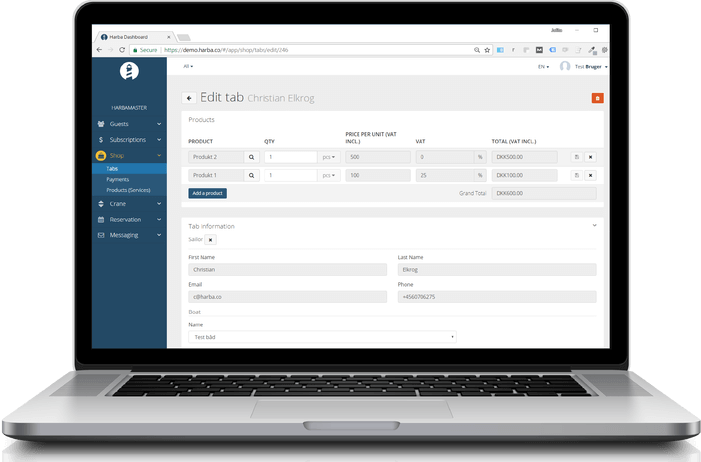 This module allows you to send automatically generated invoices or reminders to multiple boaters and get marina payments directly to your bank account. It is possible to have the module adapted to both marina and sailing club operations. The Subscription Module is focused on handling all the “permanent” berth holders and boaters who consider your marina to be their home port. This is your CRM database with information on boats, their owners, contact details, contracts, insurance papers and their current or past subscriptions in your marina. This module allows you to send automatically generated invoices or reminders to multiple boaters and get marina payments directly to your bank account. It is possible to have the module adapted to both marina and sailing club operations. The Shop Module provides you with complete payment and services flexibility. It allows you to create unique products, prepare invoices and charge your customers. Through the module you can allow your marina guests to buy various services or products throughout their stay and pay only once. They can pay by giving cash, getting invoice via email containing a payment link or directly with their credit cards. All you need is a computer, tablet, smart-phone or a hand-held device. The Shop Module provides you with complete payment and services flexibility. It allows you to create unique products, prepare invoices and charge your customers. Through the module you can allow your marina guests to buy various services or products throughout their stay and pay only once. They can pay by giving cash, getting invoice via email containing a payment link or directly with their credit cards. All you need is a computer, tablet, smart-phone or a hand-held device. The Crane Module brings your marina’s crane reservations to the next level. 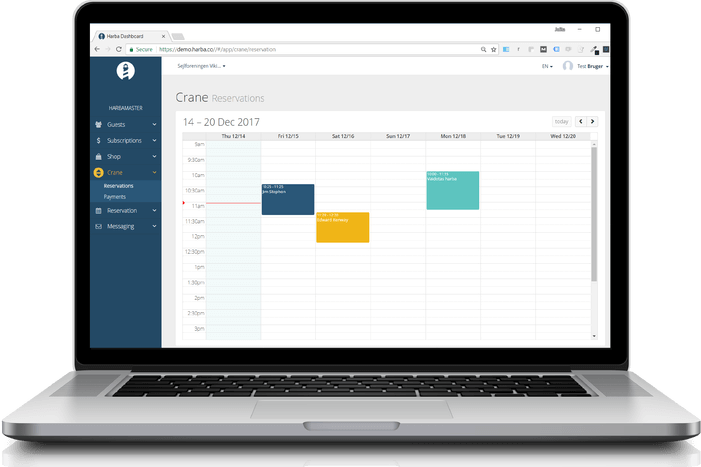 It gives you an access to a digital calendar allowing your boaters to book time-slots for crane-lifts in and out of the water. Set up your own rules to govern their booking options and let the boaters book their time-slots for your approval. Check out the schedule and print the daily activity list for the crane operator. The Crane Module brings your marina’s crane reservations to the next level. It gives you an access to a digital calendar allowing your boaters to book time-slots for crane-lifts in and out of the water. Set up your own rules to govern their booking options and let the boaters book their time-slots for your approval. Check out the schedule and print the daily activity list for the crane operator. The Messaging Module makes it possible for the marina staff to e-mail or text-message individuals or groups of boaters. Groups can be created through filters such as subscription type, bridge, berth spot, club membership, etc. In combination with the Guest Module it is also possible to message current visitors, making it possible for a whole new level of services at your marina. 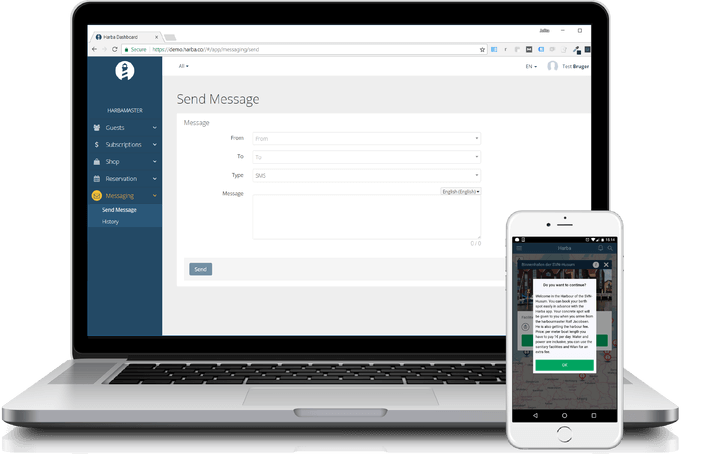 The Messaging Module makes it possible for the marina staff to e-mail or text-message individuals or groups of boaters. Groups can be created through filters such as subscription type, bridge, berth spot, club membership, etc. In combination with the Guest Module it is also possible to message current visitors, making it possible for a whole new level of services at your marina. We are constantly making updates and developing new features. You can always request for customised solutions designed specifically to meet your marina’s needs. Our marina management solution is based on a yearly or monthly subscription fee which depends on individual marina needs. It is our experience that each marina is very unique in its setup and focus, and for this reason we have built our software with flexibility in mind. We simply want our solution to match the exact needs of each individual marina – no more, no less. Visit our pricing page to find out more about our pricing packages. HarbaKiosk is a stationary self-service payment terminal allowing boaters without a smartphone and HarbaApp to pay for marina services easier than ever before. 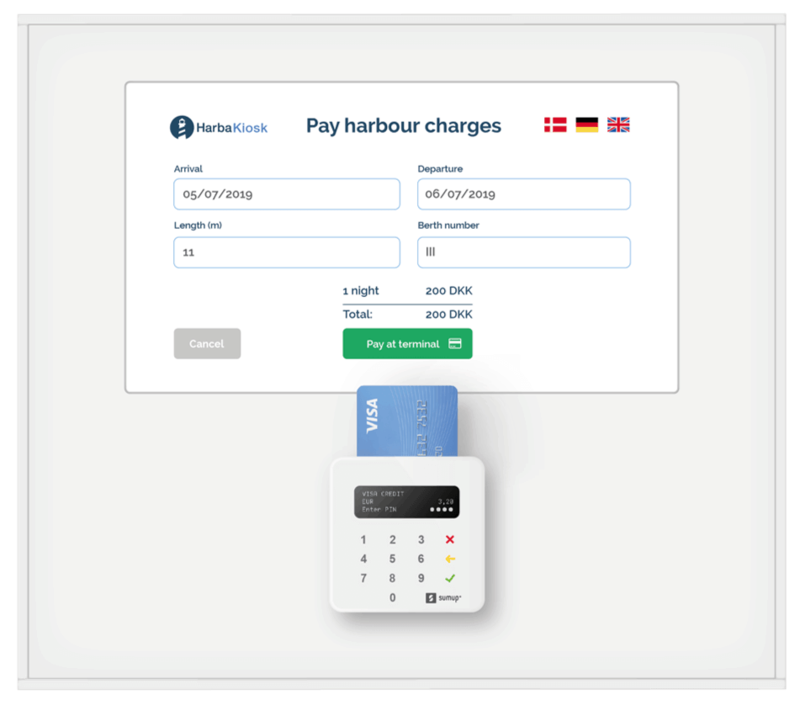 It also significantly cuts your marina payment related costs as HarbaKiosk is way cheaper than other payment terminal alternatives in the market.